Roger with greenhead . Photos courtesy of Don Webster. We’d just arrived at Lower Klamath and Tulelake. It was a waterfowler’s paradise. There were thousands of ducks and geese. It was cold, the skies were cloudy, and the wind was steadily increasing. The stage was set for a great hunt. Roger and I were giddy with excitement. Our first draw at the Tulelake check station was a space blind -- Unit 6A. It was a flooded wheat field being ravaged by big ducks. Mallards. Pintails. Gadwall. Wigeon. Wow! Practically a guaranteed limit by 9:30 a.m. We backed the duck boat into the launch site, and our nostrils were immediately bombarded with the smell of gasoline. Fuel was pouring out of the carburetor, quickly emptying the boat motor’s gas tank. Cuss words were invented that nobody had ever heard before. Our hunt was over before it began. We spent the rest of the day diagnosing and attempting to remedy the problem with the carburetor, which turned out to be a broken float mount. We jerry-rigged the carburetor to allow the motor to function intermittently, sputtering at around 70 percent of its capacity. A new carburetor was ordered that, with luck, would arrive in a day or two. We hoped to rebound from our bad luck. The second day of our hunt looked even more promising than the first day. We’d drawn a special unit surrounded by a closed zone, and we would have the place all to ourselves! A great, memorable hunt almost surely awaited us. And yes, the hunt would turn out to be great, but it will not be remembered like we thought it would be remembered. After launching our boat, we motored 30 yards and ran aground. We were stuck in the mud. We soon discovered that most of the water in the hunting unit had mysteriously drained out of it overnight! An employee of the Lower Klamath Wildlife Area arrived shortly and told us he had no idea what had happened to the water. We were informed that there was still enough water to hunt the main area of the unit. We’d have to walk out to it carrying decoys, shell bags, guns, etc. It was a slug through quagmire that turned out to be just short of 500 yards. We invented more new cuss words that nobody had ever heard before. We did manage to bag our limit, but not before our lungs were exploding, our tongues were hanging almost down to our knees, and we were wringing wet with sweat. Already exhausted, we walked back in gummy mud with 14 big ducks on top of our hunting gear. This created exercise that is not healthy for 65 and 70 year-olds. We downed an assorted variety of pain pills and were in bed that night by 6:30 p.m.
3:15 a.m. arrived much too quickly. Amazingly, prospects for our third hunt looked almost as good as the day before. Unfortunately, by now, Murphy’s Law (if anything can possibly go wrong, it will go wrong) had taken a firm hold on us. As we prepared for the launch, the safety rope broke loose, and we watched helplessly as our boat drifted into deep water and floated away from us in the dark! Needless to say, the boat was carrying our guns, shells, lunch, and decoys. We couldn’t think of any more new cuss words, so we took turns banging our heads against a portable toilet. By the time we drove back into town and found someone to help us retrieve our boat, the day was lost. Shooting time at Lower Klamath and Tulelake ends at 1:00 p.m.
Our luck had been so bad that we were almost afraid to go hunting the next morning. The logical progression of our extended outing had us thinking that death and destruction was probably looming in our immediate future. After a short period of meditation and prayer, we decided to buck the odds and give it a go anyway. Hey. We were already old, and what the heck, we’d both had a good life. By 11:30 a.m. neither Roger nor I had fired a single shot. The skies were empty. We weren’t surprised, and we weren’t disappointed. We sat drinking coffee and eating sandwiches. After what we’d been through the past, few days, we were just happy to have made it out to the marsh. And then, just before noon, a strange thing happened. Ducks started flying. Dozens and dozens of ducks. They came at us in waves, God only knows from where. Singles, doubles, flocks of six, eight, and more. Teal. Pintails. Wigeon. Mallards. Buffleheads. 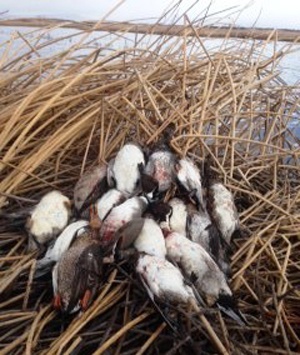 Canvasbacks. And, as always, Spoonies. We banged away, hooting and howling like quack heads going crackers, filling the air with burnt powder, spent wads, and polished steel. Ducks splashed down on the water like sacks of potatoes. By 1:00 p.m. we had our limit. At day’s end, we were bruised, battered, and worn to a frazzle. We both felt like we’d been yanked through a knothole sideways. But we were happier than jackasses eating thistles. 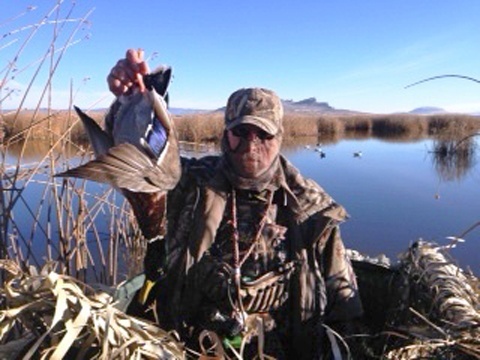 We had ducks, and we had memories that only duck hunters can appreciate and treasure.